CALIBER CRMA3: automatic winding movement with hours, minutes, rotor in 5N gold and Dizzy Hands function. Diameter: 42.70 x 11.70 mm. POWER RESERVE Circa 50 hours (±10%). BASEPLATE AND BRIDGES MADE OF GRADE 5 TITANIUM Microblasted grade 5 titanium with electroplasma treatment gives great rigidity to the baseplate, as well as precise surface flatness which is essential for the perfect functioning of the gear train. The bridges are also created in grade 5 titanium, microblasted and electroplasma treated. 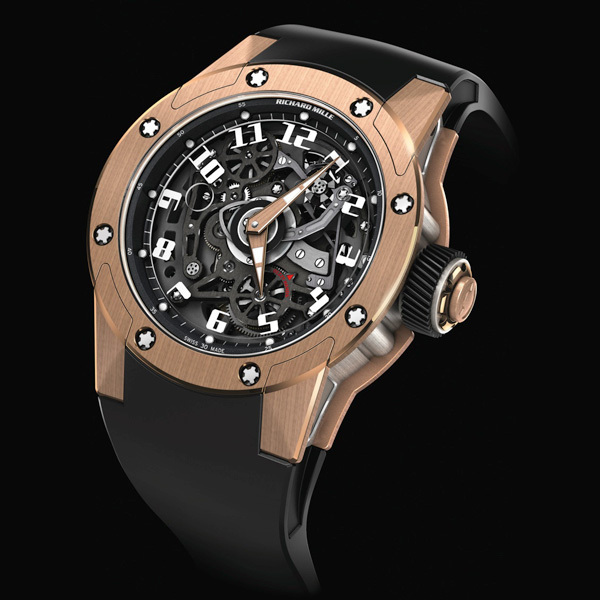 NEW DIZZY HANDS COMPLICATION The Dizzy Hands mechanism is a new horological art complication. The hour numerals are carried on an antireflective disc of sapphire crystal. Pressing the crown causes this disc to begin a slow, counterclockwise, ballet of rotation. At the same time, the hour hand continues in a clockwise direction, but at a different speed. The result is that Time has been momentarily suspended for private moments of personal pleasure, shared or for oneself. Pressing the crown again brings an end to this dance of relativity and restores the sapphire disc and hand to their normal positions: Time as we know it is restored.. Inspired by the chronograph, the column-wheel positioned at 1 o’clock actuates the rotation mechanism of the sapphire hour disc and hour hand. The hammer, positioned at 3 o’clock, triggers the return of the RM 63-01 to its initial state, displaying the exact time. FREE SPRUNG BALANCE WITH VARIABLE INERTIA Guarantees greater reliability when subjected to shock and also during movement assembly and disassembly, hence better chronometric results over time. The regulator index has been eliminated, thus guaranteeing a more accurate and repeatable adjustment is possible thanks to 4 small adjustable weights located directly on the balance. FAST ROTATING BARREL (5 hours per revolution instead of 7.5 hours) This type of barrel has the following advantages: - The phenomenon of periodic internal mainspring adhesion is significantly diminished, thereby increasing performance, - Provision of an excellent mainspring delta curve with an ideal power reserve/performance and regularity ratio. NEWLY DEVELOPED GEAR TEETH PROFILE The entire going train of the watch, the primary transmitter of power throughout the movement, utilizes a special profile for the teeth of the wheels. The wheels use a 20° pressure angle. This system equalizes any discrepancies that might arise between the axles of each wheel, for instance during thermal changes and normal use, and promotes an excellent transmission of torque to the balance wheel, thus supporting excellent chronometric characteristics. 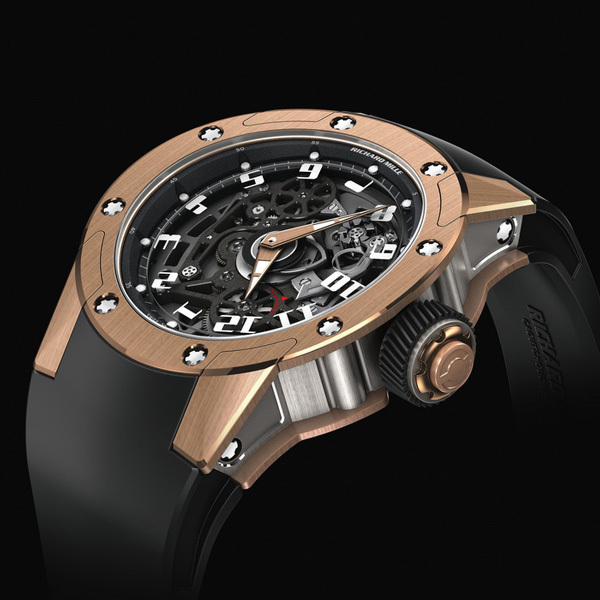 SPECIAL FLAT-HEAD MOVEMENT SCREWS Richard Mille has utilized the best of modern micro-mechanical engineering in the use of special flat-head screws in the caliber CRMA3. These unusual screws with their 6 holed heads are based upon the snake-eye screw concept principally used in the assembly of parts that require extremely exact torque to be applied. SPLINE SCREWS IN GRADE 5 TITANIUM FOR THE MOVEMENT This permits better control of the torque applied to the screws during assembly. These screws are therefore unaffected by physical manipulation during assembly or disassembly and age well. CASE The design and execution of the watch demonstrates a complete conceptual approach to the movement, case and dial. As a result, everything has been constructed according to extremely rigorous specifications. 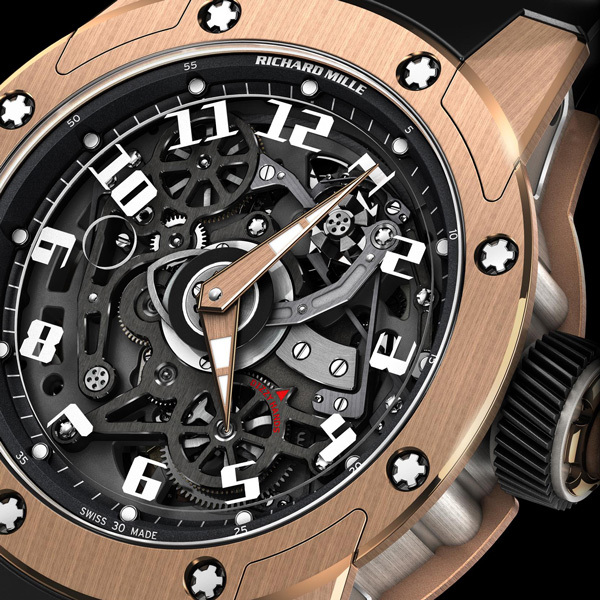 It takes a whole series of stamping and machining operations and several days of adjustments to make the three-part case with its curves used for the first time by Richard Mille. 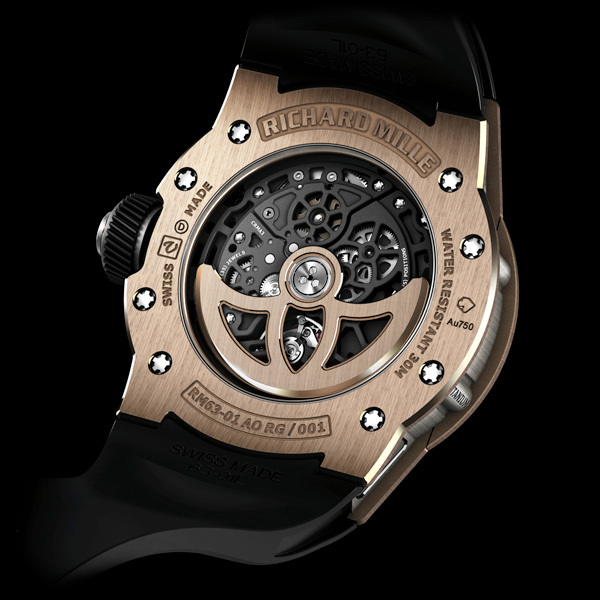 For each case machined, a period of 45 minutes is needed just for the positive engraving of the name “Richard Mille”. The case is assembled with 16 spline screws in grade 5 titanium and abrasion resistant washers in steel 316L. The system is completed by the incorporation of the lugs as separate elements of the case design. CROWN In red gold with O-ring seal and Alcryn® collar. SPLINE SCREWS IN GRADE 5 TITANIUM FOR THE CASE This permits better control of the torque applied to the screws during assembly. These screws are therefore unaffected by physical manipulation during assembly or disassembly and age well. LOWER FLANGE In carbon fiber; index points filled with approved luminous material. DIAL In sapphire (thickness: 0.40 mm) anti-glare treatmant (both side).